A new generation of green teenagers are prepared to support radical measures to help the planet, says a new study. A survey of 16- to 19-year-olds by the Future Foundation found more than one in eight (13%) supported a ban on traveling by air for leisure purposes, while one in 10 say they would back a ban on cars if global warming continues to worsen.Â Almost 10% even say they would be prepared to take part in guerrilla activities carried out by environmental groups [click the title of this post to read the full article]. … where no architect has gone before. As many of you may have heard, Sir Norman + Partners were chosen to design the first commercial ‘spaceport’ – the New Mexico Spaceport Authority Building [yes, the New Mexico Spaceport Authority really exists], run by the appropriately named Virgin Galactic. Now the design has been released [as of last week, I believe], revealing an interesting futuristic/alien looking spaceport that I think looks a lot like the cross between some extra-terrestrial mothership and a crop circle. It all started on Wednesday, May 30, when NPR Morning Edition’s Steve Inskeep interviewed Greg Easterbrook, a contributing writer to WIRED magazine. Easterbrook criticizes NASA’s recent priorities in a not-so subtly titled article, How NASA Screwed Up (And Four Ways to Fix It), in WIRED issue 15.06. In said article he claims NASA is wasting tax dollars on building a “pointless Motel 6 on the moon,” among other things, when they should be focusing on more practical studies, such as curbing global warming. Here is a set of rational priorities for the National Aeronautics and Space Administration, in descending order of importance: (1) Conduct research, particularly environmental research, on Earth, the sun, and Venus, the most Earth-like planet. (2) Locate asteroids and comets that might strike Earth, and devise a practical means of deflecting them. (3) Increase humanity’s store of knowledge by studying the distant universe. (4) Figure out a way to replace today’s chemical rockets with a much cheaper way to reach Earth orbit. Here are NASA’s apparent current priorities: (1) Maintain a pointless space station. (2) Build a pointless Motel 6 on the moon. (3) Increase humanity’s store of knowledge by studying the distant universe. (4) Keep money flowing to favored aerospace contractors and congressional districts. This attack on NASA lead to a rebuttal by NASA administrator Michael Griffen on Thursday’s Morning Edition on NPR. In his interview with Steve Inskeep, Griffen defended the space program’s mission to build a permanent base on the moon. He also acknowledged the scientific evidence of global warming and mankind’s probable influence on climate change. He would not concede, however, that warming is a problem that needs to be handled and he rather clearly gave his opinion that it is not NASA’s job to handle it. Nowhere in NASA’s authorization, which of course governs what we do, is there anything at all telling us that we should take actions to affect climate change in either one way or another. We study global climate change, that is in our authorization, we think we do it rather well. I’m proud of that, but NASA is not an agency chartered to, quote, battle climate change. Later Thursday afternoon, on NPR’s Day to Day with Madeline Brand, NASA scientist Jim Hansen, a climate change expert at the Goddard Institute for Space Studies, seemed stunned by Griffen’s comments. His department at NASA recently published a paper that concludes if climate change continues in the direction it is going there will be “devastating implications for many people on the planet”. Hansen called Griffen’s assertions “remarkably uninformed”. Hansen also explained how NASA’s funding directed toward research on climate change has recently been cut by 30%. Ironically, Hansen’s primary reason for being on the show was to comment on President Bush’s recent announcement of a new strategy on Global Warming. It seems NASA needs to get its story straight and its priorities in line. It would be a dream come true for the airline industry: A plane that uses up to 30 percent less gas to reach its destination, compared with today’s jets. That’s the promise of the blended-wing, a radically new kind of aircraft set to take to the skies for the first time this month. Originally conceived by McDonnell Douglas and developed by NASA, the blended-wing merges fuselage and wings and eliminates the tail, reducing drag. 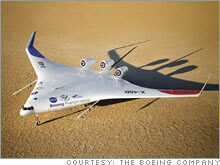 That makes it vastly more fuel-efficient than regular “tube-and-wing” jets, according to Boeing engineer Norm Princen. For now Boeing is focused on making a military version of the plane by 2022. But by 2030 blended-wing aircraft could be carrying commercial passengers. Last November a team from MIT and Cambridge University unveiled the SAX-40, a blended-wing design that promises to be more fuel-efficient than a Toyota Prius – and thanks in part to the engine placement, just as quiet (at 63 decibels).